Home NewsIs Google’s Pixel 2 and Pixel XL a Rivalry for iPhone X?? Is Google’s Pixel 2 and Pixel XL a Rivalry for iPhone X?? Google’s Made By Google went live on Oct 4 and the world came to know about their latest Pixel devices the Google Pixel 2 and the Google Pixel XL. The Google Pixel device the search engine giant undoubtedly introduced a next-generation device. Talking about the Indian Availability, Google plans to sell their latest Pixel device through 1000 stores in India as well both of the latest Pixel devices will be exclusively available via Indian e-commerce website Flipkart. However, both of the latest pixel devices will be up for pre-order on October 26. However, the Pixel 2 device will be up for sale from November 1. Talking about the Pixel XL, the Google device will go on sale from the November 15. Pricing: Talking about the pricing of the Google Pixel 2. The first variant of Google Pixel 2 holds a price tag of 61,000 in India and the second variant holds a price tag of 70,000. The first Google Pixel XL variant will cost you 73,000 and the second variant will cost you 82,000. However, Apple’s latest devices cost you a little bit extra compared to the pixel devices. The Apple iPhone 8’s lowest version is priced at Rs.64,000. The Apple iPhone 8 plus is priced at Rs.77,000. Google Pixel 2 Specifications: Talking about the specification of the device the Google Pixel 2 smartphone comes with an AMOLED 5inch display with a resolution of 1920×1080 pixels. The display also comes with a Gorilla Glass 5 protection. Under the hood, the smartphone the powered by the Qualcomm Snapdragon 835 processor. Though earlier there was a rumor that the new pixel devices would be powered by the rumored Qualcomm 836 processor it was just a rumor. The smartphone comes with 4GB of RAM. On the storage section the smartphone comes with two options first one is 64GB of internal storage and the second one comes with the 128GB of storage. Talking about the camera, the device does not come with a dual camera setup but do features a 12.3MP rear camera with dual LED flash and f/1.8 aperture. On the front panel, there is an 8MP camera with an aperture of f/2.4 for selfies. The battery of the device is 2700MAH and will be running on the latest Android version the android oreo. 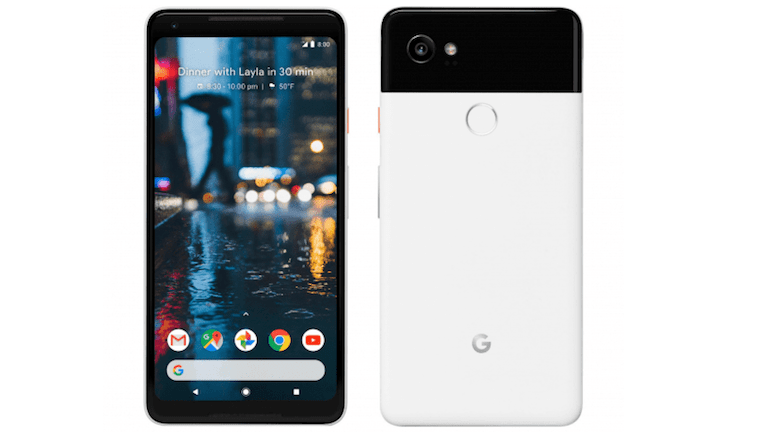 Google Pixel 2 XL Specifications: Coming to the specifications of the Google Pixel 2 XL, the device sports a bigger screen then the Google Pixel 2. The Pixel XL device screen is 6-inch OLED QHD display. The display comes with a resolution of 2880×1440 and sports an 18.9 ratio. The device also sports a Qualcomm Snapdragon 835 processor. And comes with 4GB of ram with a 64GB and 128GB storage variant. The device also sports similar camera as the Google Pixel 2. However, the battery of the device is 3250MAH and will be running on Android oreo too. Conclusion: The new Google pixel device also ditched the headphone jack like Apple did and introduced the wireless headphones. Google also promised to roll out software and security updates for the next 3 years. As well with Google Pixel devices users will also get unlimited cloud storage for their photos and videos till 2020. Be the first to comment on "Is Google’s Pixel 2 and Pixel XL a Rivalry for iPhone X??"